Founded in California in the late 1980’s, Luminox has quickly become one of the most-trusted brand names in the watch world. The creators were inspired when they came across a Swiss self-powered illumination system and knew that it would make watches more visible and easier to read in low or no light situations. And for over 25 years, this company has been driven by a commitment to offer cutting-edge luminescence and readability in its line of high-performance sports watches. Luminox products combine the finest tradition and precision of Swiss watchmaking with the durability demanded by US armed forces and the latest innovations in timepiece technology. 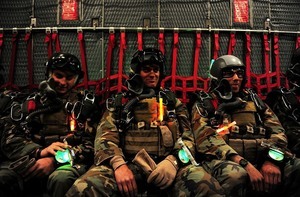 As pioneers of the small individual luminescent tracer lamps, Luminox was contacted, in 1999, by the U.S. Navy SEAL teams to build a dive watch for their use on night missions. Year after year, these were the only watches to meet the rigorous demands of the Navy SEALs and earned the prestigious title of A.N.U. (Authorized for Naval Use). After their popularity in the Navy grew, the Air Force asked Luminox to develop a watch specifically for F-117 Nighthawk Stealth pilots. Since then, the company has created exceptional watches to operate on land, air, and sea. After reviewing all the top Luminox Watches available, we’ve selected our top 7 picks in the comparison table below. We’re confident you’ll find the perfect model for your needs. Mobile Users: For optimal viewing, tilt your phone to landscape (wide-view) to see the entire table. This article includes a brief overview of three of the most-popular Luminox watches on the market. All of these watches have received high reviews from previous users, and each contains its own unique set of features. Before buying your timepiece, think about the demands that will be placed on it, and then pick the model that best matches your needs and lifestyle. Fortunately, with a number of Luminox models available, it shouldn’t be too difficult to find the right fit. If you want to learn more about the most popular luminox watch then continue reading below. This great looking Luminox watch highlights the features that so many users love about this brand. We consider this one as one of the most popular watches amongst the others. It is a quality piece of equipment, with a stainless steel case that includes a window with an anti-reflective sapphire dial. The band is made from molded rubber, and the watch is water resistant up to 200 meters. This timepiece is not intended for serious scuba diving, but it is up to the task of other professional marine activities. As you would expect from a quality watch, this model uses quartz movement to keep accurate time as the years go by. Those who are currently using the watch love the display’s ease of readability, even at night. Also, they love the aesthetics of the equipment. Many also feel that the product represents a great value for the cost. If you would like to get into the Luminox market with a quality product that can go with you just about anywhere, then this model should be given strong consideration. This Luminox watch is part of an exclusive collaboration with Indy 500 Champion, Tony Kanaan. Featuring TK’s iconic asymmetrical black case, this ultra-light but strong carbon-reinforced polycarbonate racing watch features a black dial with green hands and yellow numbers, evoking his Brazilian heritage. The analog timepiece is easy to set and adjust and features a scratch-resistant mineral crystal display. Its 45 mm (diameter) case and stationary bezel are made of resin and secured with a black rubber strap. This unique timepiece utilizes quartz movement and is water resistant up to 660ft underwater. But do not let the luxurious look of this timepiece fool you, it is incredibly durable. This iconic piece has a modest price and a great accessory to add to your ensemble if you want to turn heads at your next party. This watch’s “triple black” color scheme is a popular look among Luminox owners. The black-on-black-on-black colorway makes this timepiece ideal for any occasion and activity. If you love this dark look, you will be happy to find that the timepiece carries most (if not all) of the features you would expect and require. This analog watch water resistant up to 100 meters and uses quartz movement. The case is a black carbon-reinforced polymer and features a rubber band. The luminous hands make this Luminox timepiece easy to read in the dark. Also, it features a rotating bezel and displays the date. This watch has a higher price-point, but the impressive look and abundance of features make it a worthy investment. There is little debate about the quality of Luminox watches. If you would like to add a solid piece of gear to your personal collection, one of the three Luminox watches above would be a great place to start. Each of these models has many great reviews, a classy look, and a durable build that should provide you with many years of solid performance.